Television technology and techniques have changed much since Western Australia’s first commercial station TVW Channel 7 opened on Friday October 16th, 1959. Soon to be joined by the government owned national broadcaster ABW Channel 2 on Saturday 7th May, 1960. It was another five years before Perth got its second commercial television station when STW Channel 9 opened on Saturday 12 June 1965. Another 23 years were to elapse before Perth got its third commercial television station when NEW Channel 10 opened on Friday May 20, 1988. News presentation has changed much over the decades. In the earlier years, newsreaders were employed with a trained voice and more of a British speaking style than an Australian accent. The newsreader carried most of the bulletin, reading not only the story links, but most often the voice over silent film, accompanied by music played from a selection of 78 rpm gramophone records to suit the mood. The occasional sound on film or double system carried reporters conducting brief interviews. Eventually the reporter would carry most of the story with commentary and interviews, losing the unfashionable gramophone music. News cameramen also experienced a transition from shooting news on film to the use of videotape, with the introduction of the Sony Betacam in 1982. The integrated professional video camera/recorder led to electronic news gathering (ENG). There were various generations over the years from analogue to digital tape recording, until the current solid state camera/recorders. Each change brought with it new editing techniques from film and tape editors to reporter desktop editing. Television equipment has changed considerably since TV began in Western Australia. 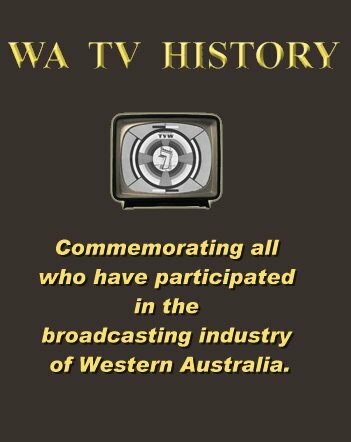 In 1959, when TVW launched television in Western Australia, the station was fitted predominantly with the British PYE Electronics equipment. Valve driven equipment that would be considered primitive today. The operational components were distributed in the control rooms and nearby telecine area. 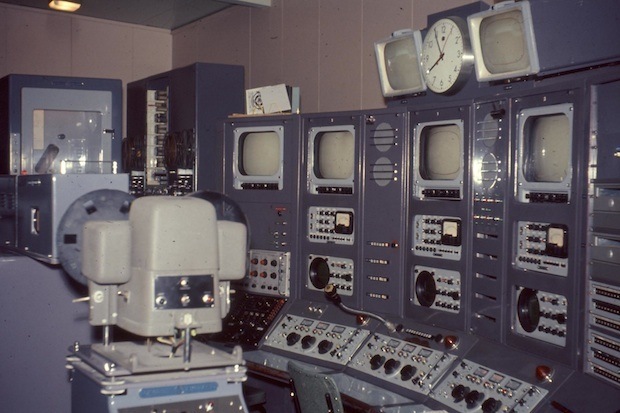 The vision mixing unit (VMU) and the audio mixing unit (AMU) were where presentation was being coordinated, though the VMU was a remote control console for the real switching that took place in the Master Control racks downstairs. All production went through one small studio, which had associated with it an announce booth for simple voice over 35mm slide, 16mm film, the station clock or caption cards. Station presentation used the studio control room, unless a rehearsal was taking place in the studio, for either a program or live commercials. Presentation was then coordinated from Master Control. Everything was live in those day, except the content shot on film. On station opening, there were only two telecine chains consisting of Philips projectors and a slide projector, sharing one vidicon camera per chain. Similar telecine equipment was employed in Perth by the ABC when the government owned broadcaster opened 6 months later. Seven also used a small postcard sized caption scanner that could hold either the test pattern, station clock or caption cards for promotional or advertising purposes. Later both Seven and ABW would use a more sophisticated PYE manufactured scanner that enabled not only a collection of larger caption cards but also the clock and a crawl for long credits to roll through. RCA Videotape facilities did not arrive at Seven until 1962, though AMPEX came up with the two inch quadraplex format in 1956, equipment which ABW Channel Two would employ. STW Channel Nine opened in 1965 with the more compact transistorised RCA videotape machines. Both Seven and STW Channel Nine used PYE black and white studio cameras, whilst the ABC started with EMI. As the years progressed, all stations employed a much wider range of equipment, from many different suppliers. Television News and program presentation has changed much over the years, and so has the tools that made it happen. At the beginning of TV in Western Australia, equipment was large and expensive. It was also primitive by today’s standards and required more effort to keep aligned and functional. Valve technology was still dominant, with its inherent unreliability. Valves were more fragile and took up more real estate on a chassis. They also generated more heat and in the process used more power. Vacuum tube equipment also needed constant attention as alignment would drift from day to day, and particularly with temperature and tube age. Transistors began the movement to miniaturisation. All tubes, including the old image orthicon, vidicon, staticon and plumbicon camera tubes became obsolete, superseded by the charge-coupled device (CCD). Bulky components were replaced by compact printed circuit boards and then tiny integrated circuits in a chip. Recording mechanisms also shrank from videotape machines populating up to five racks each, down to the present hard drives and solid state memory cards, that can reside in a camera. Meanwhile, switching and mixing facilities have become more sophisticated and complex. Artists using paint, ink, pencil, pen, brush and paper or card has been replaced by computer graphics. The cumbersome hot press has gone the same way as the Linotype typesetting machine, hot metal and letterpress printing. Not only has colour been added, but also a plethora of clever special effects. Film has long been replaced by electronic news gathering which now uses computer editing. In each step new skills have been required. Film processing has long gone as has cut and splicing, videotape, audiotape, cartridges and vinyl recordings. Everything has been modernised, including the design of studio lights. Items are now played out from a hard drive with an instant start replay, rather than early film projectors or videotape, which required a count down to stabilise. Much has changed, as the following video will illustrate. It also provides insight into both the ABC and Seven’s news presentation styles in Perth, Western Australia. It shows both the ABC and Seven use of traditional control room configurations, though the ABC has now gone one step further on the automation route, which will be explained shortly. This video provides some insight into both the ABC and Seven’s news presentations in Perth, Western Australia. Firstly, the ABC’s Kim Lord explains the intricacies of mixing sound for ABC nature programs and dramas. Kim is a perfectionist and the ABC is dedicated to getting the many facets of sound production right. A glimpse is shown of how the ABC TV news control room staff operated a few years back, before significant automation advances were made in this field. The video also touches on the different approaches of the two stations. Seven has kept their cameramen and team, using a traditional approach. Channel Nine in Perth also uses the traditional approach, though they use a virtual set rather than a real one. The set is actually a graphic generated by a computer, which adjusts the perspective according to the camera angle. 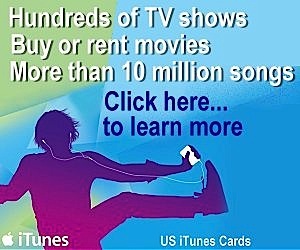 STW is owned by WIN Corporation and affiliated to the Nine Network. The call sign STW stands for Swan Television, Western Australia. STW-9 commenced broadcasting on 12 June 1965 and was the second commercial television station in Perth. It became the first station in Perth to broadcast 24 hours a day on 17 April 1984. STW-9 broadcasts from a transmitter mast located in Walliston in the Perth Hills beyond Kalamunda. Its operational base and studios are located at 9 Gay Street, Dianella, across the road from Seven’s studios. Nine News Perth is produced and broadcast live from STW’s news studios every night at 6pm (repeated week nights at 11.30pm) across Perth and regional Western Australia. In 2008, when this video was recorded, there were approximately 150 staff working at the station. Presentation was then emanating from the Dianella studios, before this was centralised – resulting in staff redundancies. In 1983, the station came under the ownership of Bond Media, controlled by businessman Alan Bond, and became a Nine Network owned and operated station when Bond purchased the network. In 1989 Bond Media sold the station to Sunraysia Television for A$95 million. The Eva Presser controlled Sunraysia TV owned around 55% of the company, whilst WIN Television owned 40% of the company. In 2007, WIN Corporation brought the station for A$163.1 million. Now in an Australian television industry first, the Wollongong, New South Wales based commercial television network owned by the WIN Corporation and the public owned national broadcaster, the Australian Broadcasting Corporation have formed a joint venture MediaHub. This is a digital playout facility designed to further centralise operations for both organisations with the intent of cutting costs. 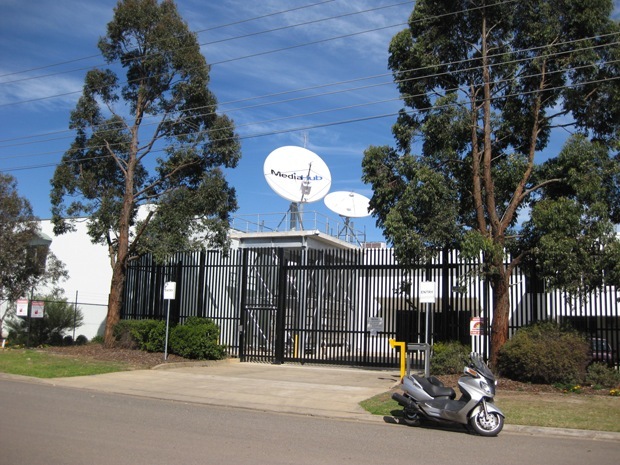 MediaHub Australia is a multi-million dollar state-of-the-art facility in Ingleburn in Sydney’s South West which will be the central location for broadcasting both WIN and ABC content to all of Australia. 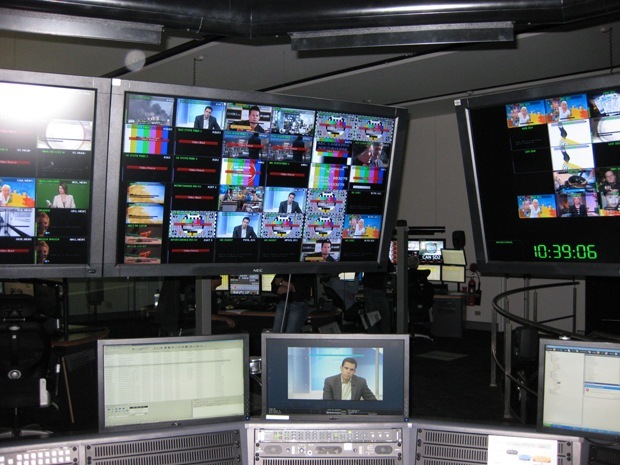 Considerable savings are made by having a shared plant that can lead to further staff trimming by centralising each broadcaster’s presentation and Master Control Room (MCR) facilities, to enable increased efficiency. The chief executive of MediaHub is Andrew Hogg, formerly of Omnilab Media. WIN Executive Chairman Andrew Gordon, said “This is the first time Australian broadcasters have worked together to invest in common infrastructure to realise significant efficiency gains. Construction on MediaHub commenced in September 2009 and the centre was officially opened in June 2010. ABC chief operating officer David Pendleton is the centre’s architect and he argued it was needed to replace ageing technology in each city. 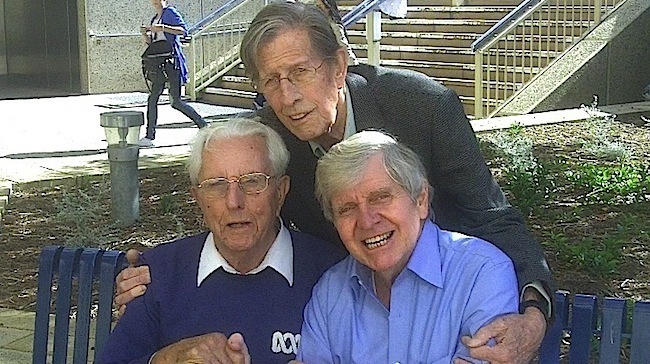 In 2001 the ABC began its conversion from analogue to digital TV with a move to digital tape based News and Production cameras, standard definition digital production studios and digital Outside Broadcast vans. Non-linear editing system (NLE) was introduced for News and TV production, as was a digital archive system for video and audio assets and the conversion of 60,000 hrs of video and audio. 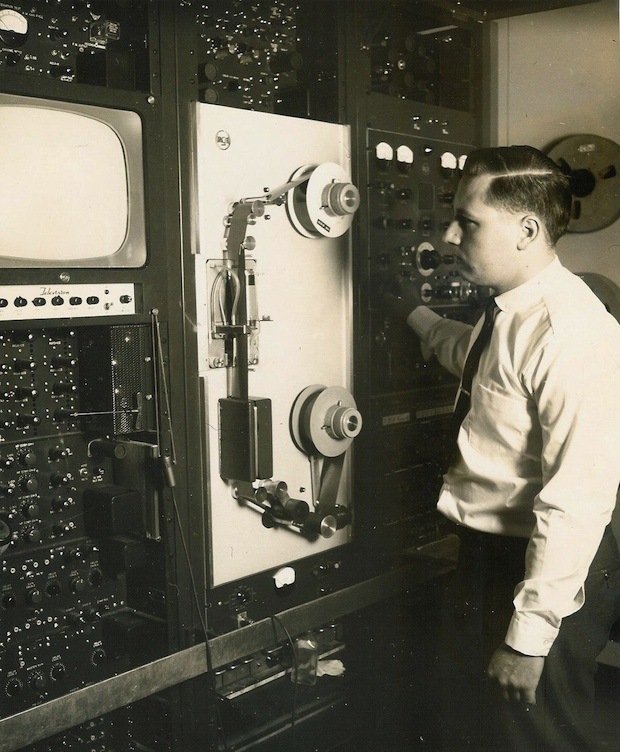 This became a big learning exercise for the ABC as the technologies were still evolving, especially computer based hard drive facilities, for at that time operations were still tape based. For not only was equipment rapidly evolving but it also made new demands on staff, who required new skills and significant work practice changes. By 2007 the first generation of digital technology had reached end of life, so the ABC decided to centralise TV presentation and introduce automated news studios. They acquired file based Electronic News Gathering cameras, such as the Panasonic P2, which use a solid-state memory storage media format, that departs from the older method of recording video onto video tape. From 2008, the ABC was committed to giving journalists a news editing capability from desktop workstations, assisted by the file based syndication of news content. This employed the Apple Xsan cluster file system, which enabled them to consolidate storage resources and provide multiple computers with concurrent file-level read/write access for use with Apple’s suite of professional applications, including Final Cut Pro® HD. Also in 2008, the ABC introduced studio automation to all ABC News studios by choosing the Grass valley “Ignite” system. In doing so, the traditional TV News control rooms, which required up to 7 staff, were downsized to one studio director, assisted by automation. 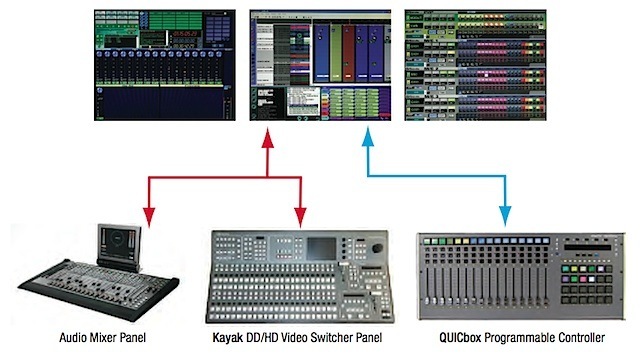 The Grass Valley Ignite is a “station-in-a-box” production system that includes a digital video switcher, audio board, router, digital video cameras, and automation control software. There is increasingly less dependance on people in the ABC News studio control room, where there is only one operator. Its now dependant on the news gatherers to take it one step further in feeding their fodder into the system. News footage is shot in the field and recorded on solid-state memory cards within the cameras. Once the video files are ingested into the nonlinear editing workstations back at the studio, editors can immediately begin cutting segments. Finished stories are then loaded into the News rundown using the Ignite system’s graphical user interface. Its important that the News department staff integrate their stories into the system in the right way to avoid glitches, and this discipline makes them meet deadlines better than they ever did before. The production staff have had to adjust their way of working as well, as proper planning results in fewer technical errors, by adjusting rundowns and developing an even flow or overall theme from among the various news segments. The Ignite system also holds everyone involved with the news production and broadcast process more accountable for what they do. In 2009, WIN TV and the ABC announced the formation of MediaHub Australia, a joint venture to collocate presentation services. 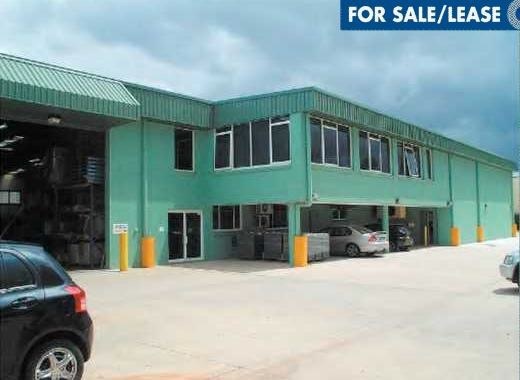 The 24,300 square foot facility is housed in a refurbished sheet metal factory in Ingleburn, a south western suburb of Sydney, NSW. 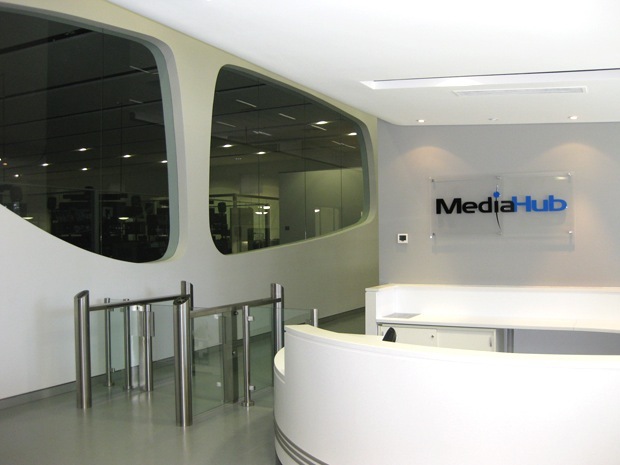 MediaHub was built to centralise each broadcaster’s presentation and Master Control Room (MCR) facilities. This means content from each of the broadcasters can be switched and routed from studios, outside broadcast vans, overseas news feeds and to external providers. Both broadcasters send their schedules to the facility, where Snell Morpheus systems generate ingest lists for the Grass Valley ContentShare2 (CS2) workflow and media asset management system, which serves as the interface between the playout center and its multiple clients’ individual production centers. Content is delivered to nearline storage, and the Morpheus systems move media to the playout server and automate playout for programming across 130 channels. This model gives centrally located operators the ability to manage multiple live content streams and variations in playout schedules for multiple time zones. 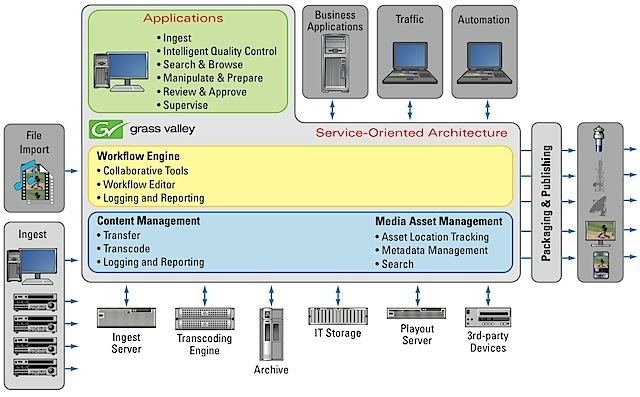 The systems are designed to transform the media industry towards a model of “packaging and publishing.” A key challenge for the state-of-the-art facilities is to manage rich media (video, audio, and graphics) as well as its associated metadata, the set of data that describes and gives information about other data, such as timecode information. The challenge is incorporating new Information technology (IT) within a legacy infrastructure. Grass Valley’s CS2 is a scalable workflow and media asset management software solution that provides interfaces to broadcast specific devices, such as video servers, and interfaces to IT-based storage systems. It also interfaces to business systems (i.e., scheduling systems) and the technical infrastructure. However, it hasn’t always been smooth sailing for MediaHub, with the facility being blamed for a series of technical glitches and broadcast delays that occurred earlier in its life. The ABC has demonstrated that it is willing to endure short term pain for long term gain. They have taken the risk of introducing new technology, and often developing it, over many decades to gain an economic advantage, often out of necessity as government funds have been reduced. The ABC developed early time delay machines to reduce staff costs when greater networking was introduced. The D-Cart digital recording facilities were another in-house development. Localisation was another initiative that enabled more to be done with less, whilst maintaining the impression that national fed programs had a local presentation feel. Each had teething problems, which will by now be long forgotten, except by those given the task to make it happen. Now MediaHub brings about a major change in the TV presentation and master control functions, by outsourcing them rather than continue to use the traditional in-house operations. Many thanks to Seven, Nine, ABC, Darcy Farrell, Derrick Wright, June Holmes, Dr Peter Harries and Chris Gore for photos and input for this story. Peter Waltham was a bloody good news reader, but jeez didn’t he have a head on him?